You have just bought a new pair of soccer cleats, and its time to break them in. So, what should you do to break them in the right way and ensure that you get a long life out of them? Let’s look at some of the steps you can take to ensure you get the most from your cleats. It is important that new cleats are ready for their first 90 minutes. In order for them to be ready, you need to get them loose and comfortable on your feet. The ‘shower technique’ is one that many pro players use to get their leather cleats ready. Chris Loftus, Neil Jones, Andy Dorman and David McGill have all talked about this technique in their articles. The hot water helps the leather expand/loosen a little, giving you some breathing room for when you use them. Another important step is to wear them jogging or during warm-up rather than wearing them for the first time in a game. The more you can do to loosen up your cleats and get them snug on your feet, the better they will be for that first game. I usually wear a pair for 2-3 jogging sessions and then into a training session. A lot of professional players have several pairs of cleats at one time so that they can break pairs in over time. Breaking cleats in properly will help reduce the possibility of blistering. You definitely want to avoid blisters! If you wear your boots and notice you are feeling the onset of blisters, it is very handy to have some Vaseline around. Just smear it on or around the areas you are feeling the blisters. The Vaseline will help your foot move a little more smoothly against you cleat reducing the friction that occurs. There are certain steps to follow when the game is finished. First, it is important to air dry your cleats. One of the worst things that about 60% of soccer players do is leave their cleats in their bag until the next practice! It is very important to take them out of your bag so they can dry naturally. One tip that the pros do to help dry out cleats is to stuff newspaper inside. This helps soak up any of the dampness that is inside. Where you leave the cleats to dry is also important. Don’t leave them in direct sunlight or somewhere that is very hot. This will only dry them out and cause them to crack. In order to keep you cleats soft and supple, you need to ‘moisturize’ them. The best solution for this is leather food. A majority of professional soccer players use leather food. I know when I came to the US from Ireland, I would have to fight guys off after practice from using all of mine! My preferred brand is Chelsea Leather Food. It has nothing to do with the Premier league team, so it’s ok to buy if you are a Man Utd fan!! 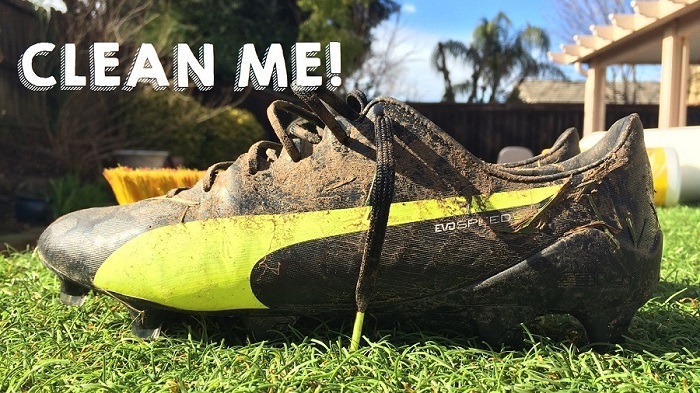 In Danny Kennedy’s review he talks about how he cleans and leather food’s his cleats the day before any game. Polish is something I used on my boots all the time as a kid. I always had to have the shiniest boots! It never hurts to polish your boots. The most professional players will grab a brush and shine those bad boys up. It is important to make sure that you use a brush to clean off any excess dirt beforehand. Boots like Copas and Puma Kings are definitely shoes you will want to polish up. A few hours after polishing, use some leather food to keep them feeling soft. So, recapping, it is important to break your cleats in slowly, dry them naturally after games, and keep them supple by using leather food. If you fancy, stuff some newspaper in them for drying, and some shoe polish for that professional player look! what is the best leather food that there is? I have seen adidas ones and the ones you mentioned above? I have the gold adizeros that I never worn yet and I've been hearing a few problems players have had with them. I'm thinking of selling my adizeros and replacing them with mercurials because they might be more durable. Any advice? Personally, I prefer the adiZero over the Mercurial range – i say test them out. Durability with the studs has been an issue, but not for every player! For breaking in, does shower technique work for synthetic cleats? And, should I soak it or just slightly dampen them? No – not for synthetic! It works for leather only, where the material is designed to stretch. I just got the white/gold/black T90's off ebay, and I'm wondering if there is any way to tell for sure whether or not they're leather or synthetic. The store said they were made with K leather, but it's ebay, sooooo…. What is the difference between leather conditioner and leather food? The shower trick helps loosen stitching, so it is only really useful if there is stitching through the upper! How do i maintain copa mundials for collection purpose? Zip lock? Dubblin oil? Sileca gel? What shd i do to maintian these boots as collection?